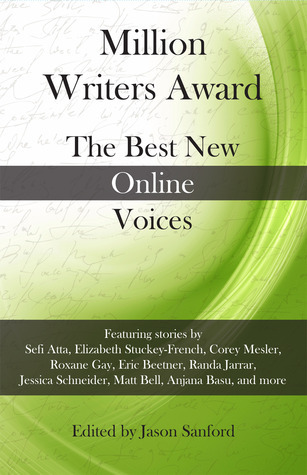 Wonderful collection from ten years of the online award for short fiction. Jason Sanford Sruthi Thekkiam Matt Bell Marshall Moore Anjana Basu Kara Janeczko Corey Mesler Gokul Rajaram - Born and raised in the American South, Jason Sanford worked in various parts of the world as an archeologist and Peace Corps Volunteer before settling down in the Midwestern U.S. with his wife and sons. In the last few years he has published more than a dozen stories in the British SF magazine Interzone, which devoted a special issue to his fiction in December 2010. In addition, his fiction has been published in Year's Best SF 14, Asimov's Science Fiction, Analog: Science Fiction and Fact, Orson Scott Card's Intergalactic Medicine Show, Tales of the Unanticipated, The Mississippi Review, Diagram, Pindeldyboz, and other places (along with being translated into a number of languages, including Chinese, French, Russian, and Czech). His story story collection Never Never Stories was published in 2010.He is a three-time winner of the Interzone Readers' Poll and has been a finalist for the Nebula Award for Best Novella. He also co-founded the literary journal storySouth, through which he ran the annual Million Writers Award for best online fiction. He writes a monthly column for the Czech SF magazine XB-1.